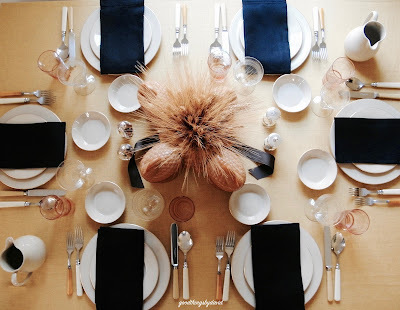 I want to show you our Thanksgiving table before we sit down to dinner in a few hours. This year is all about setting a table with earth tones that connote the season's best colors. I love gold, black, caramel, deep yellows and and creamy taupes. With that in mind, I took out a good Wedgwood pattern that gets used a lot here at home, and then I complemented it with a golden-colored linen tablecloth, some black linen napkins and mismatched bakelite. 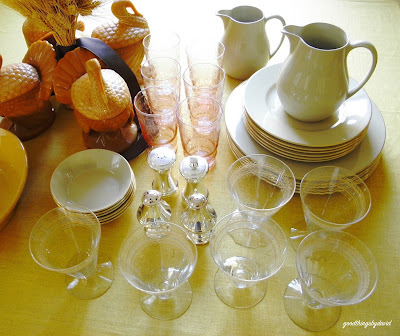 The glassware was etched Depression glass. I love the simplicity of our table. This is an overview of the table looking toward the kitchen. 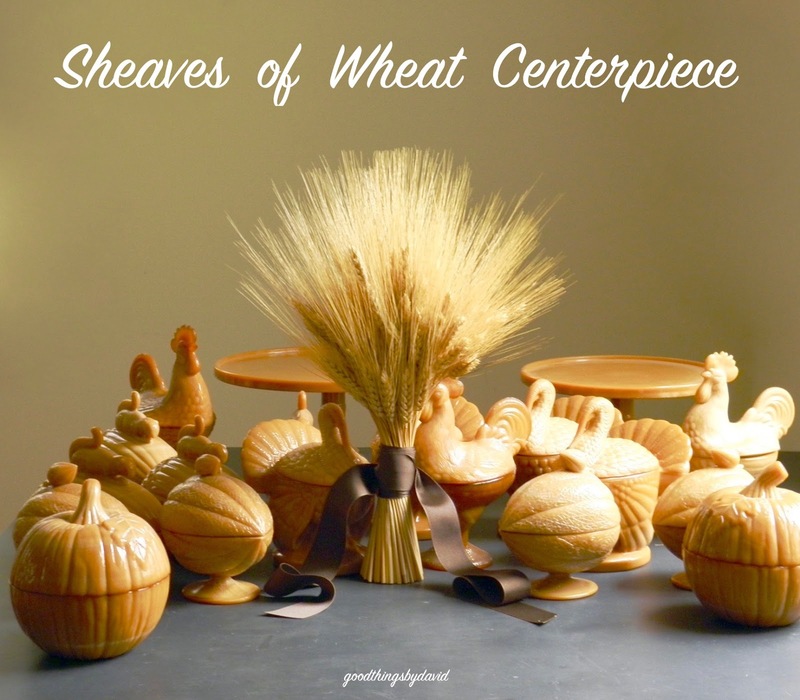 The sheaves of wheat centerpiece was surrounded by a flock of caramel glass, L.E. Smith turkeys. 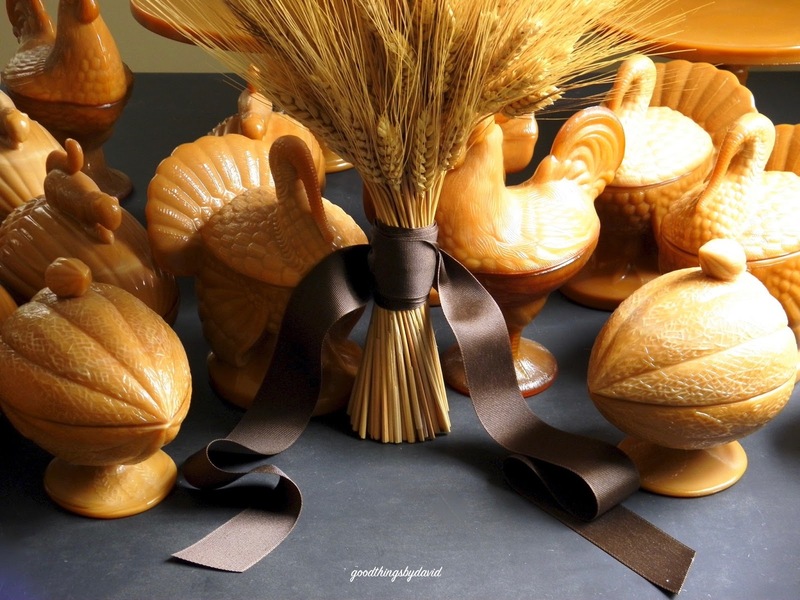 These are going to be used to hold cranberry sauce for guests. 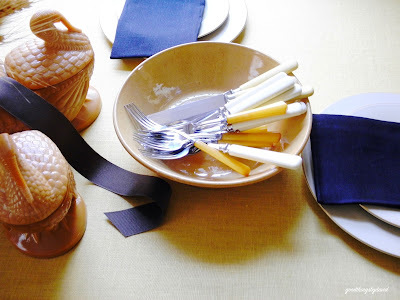 The flatware is vintage and not-so-vintage bakelite. 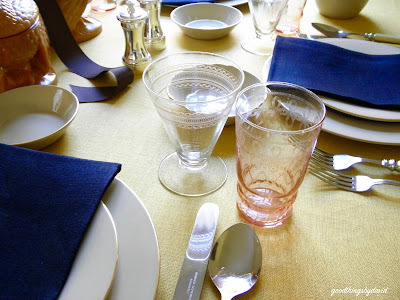 I didn't want to set the table with silver this year, so I completed a mismatched place setting for each guest. The wine glasses are quite old, and I absolutely love them because they are beautifully etched with some gilding. The pink Depression glass tumblers are also etched. My dinnerware is Wedgwood drabware made for the former Martha by Mail catalog. I love the gilded plates. 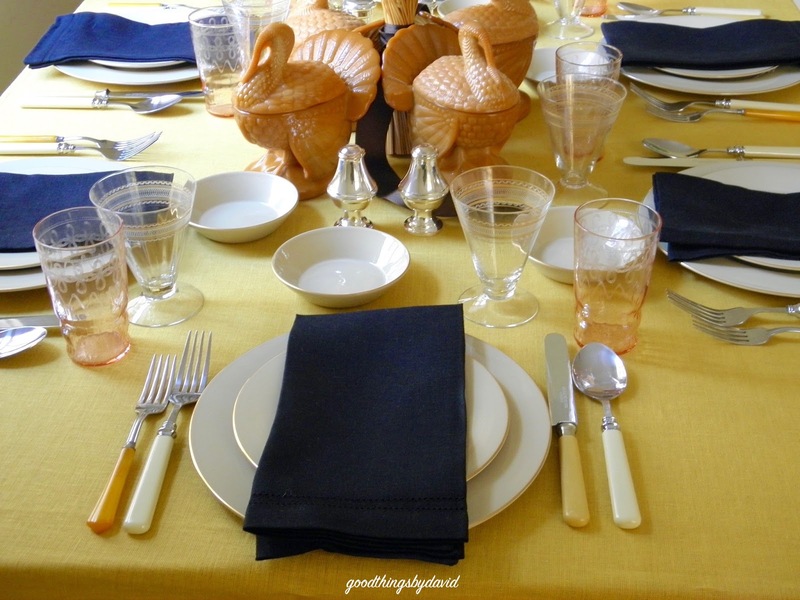 Water will be placed in the drabware pitchers at each end of the table. Do you see what I mean about the beauty of the glassware? Each guest gets a salad and dinner fork, along with a spoon and dinner knife. The black napkins, as well as the wheat-colored tablecloth, are double hemstitched European linen. As I said earlier, the dinner plate, the salad plate and the saucer (used for rolls) are all from the same pattern of Wedgwood. 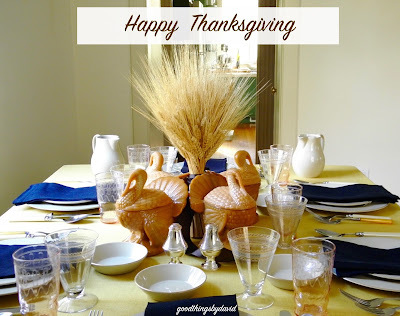 Rather than having individual salt cellars, I used silver salt and pepper mills and shakers at each end of the table. On this end, I have a set of Chiarugi silver salt and pepper mills made exclusively for Martha by Mail. On the other end, I have silver salt and pepper shakers made for Williams-Sonoma. A quick overview of our Thanksgiving table. and are surrounded by good company. Every Thanksgiving table should have a centerpiece, whether it be fresh flowers, a cornucopia of fruits and nuts, or a crafted arrangement of seasonal items. 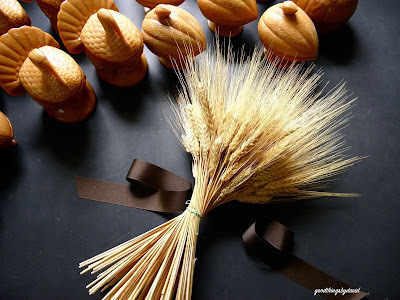 I have been wanting to make a simple centerpiece using sheaves of wheat, and this year was the perfect time to do so. Nothing could be easier than tying up a bundle of wheat for an earthy table arrangement. 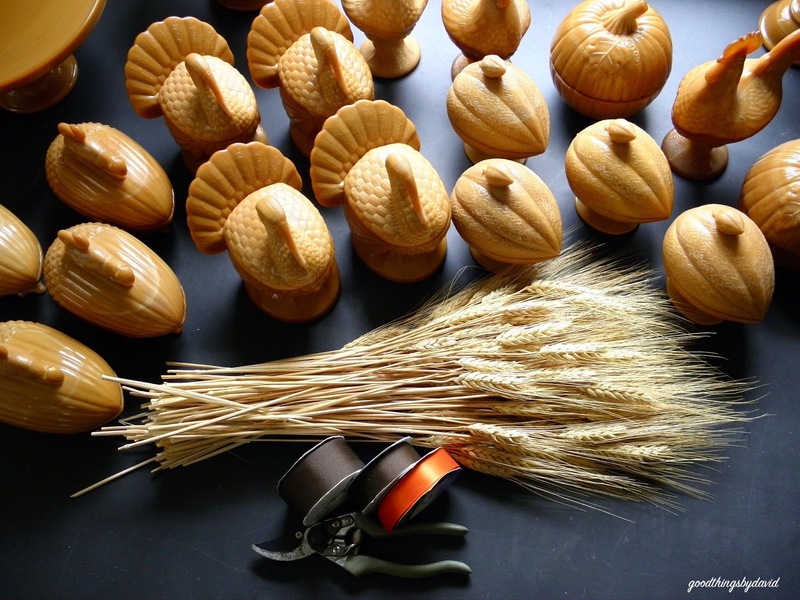 Preserved wheat bundles can be purchased from many different sources. The stalks lend themselves to so many uses for table settings, and if you want to get really crafty, you can even make a giant wreath. 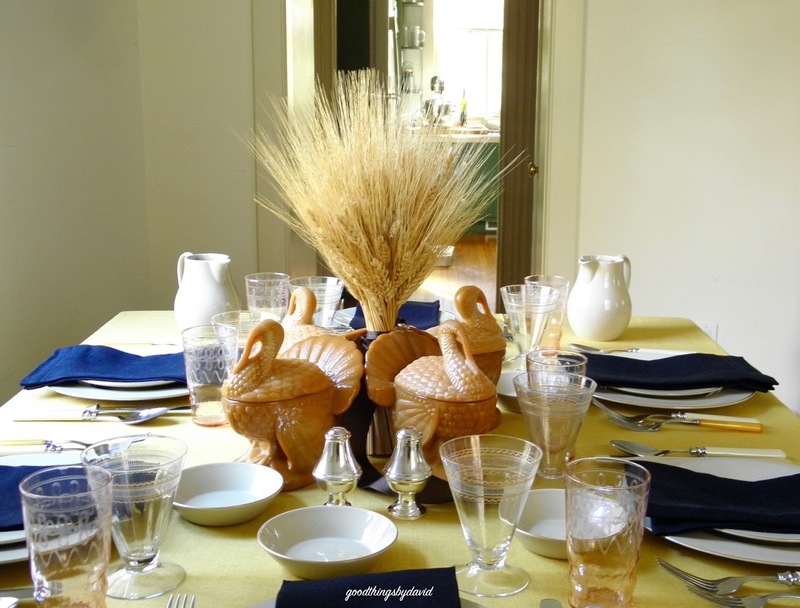 If you buy a small sheaf, the bundle can quickly be assembled into a festive centerpiece for Thanksgiving. You can, however, break up the bunch and make many smaller sheaves for individual place settings, or to place down the length of your dining table. These beautifully preserved wheat stalks sitting next to my collection of Martha by Mail caramel glass are ready for assembling. 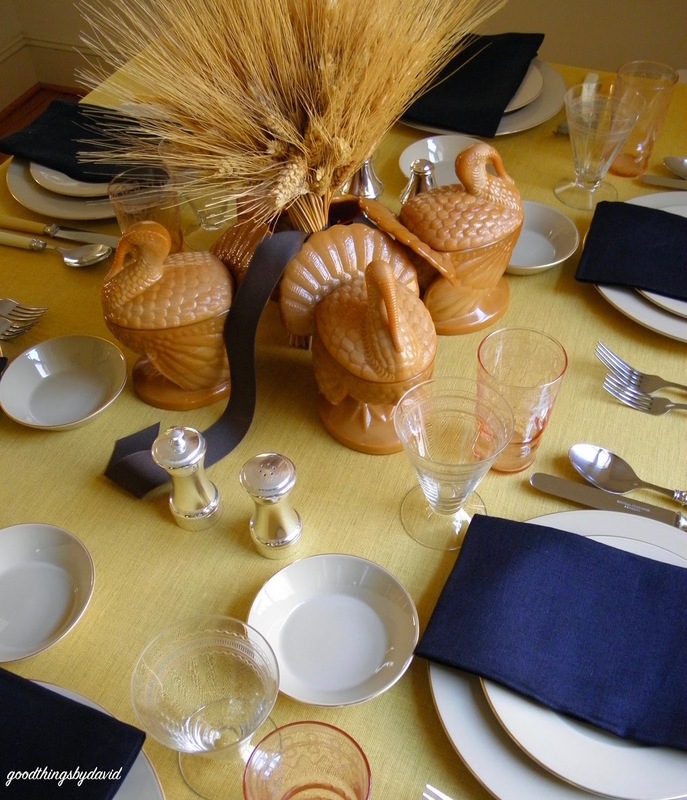 Depending on the length of the stalks that you buy, you may need to trim them down to have them sit on the table. Use a sharp set of pruning shears for this project, and make sure that you have plenty of table space. 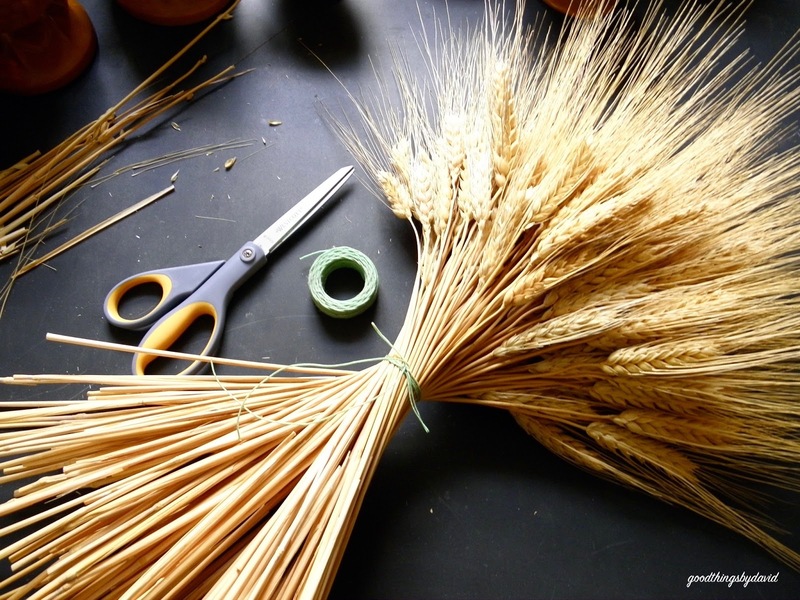 Once you begin cutting, you will have a shower of wheat grains and stalks all over your table, so have a small dust pan and brush handy. 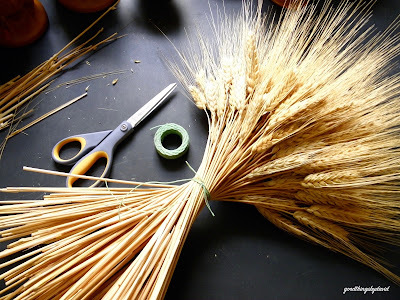 Stack and arrange the sheaves into a nice bundle, and with some waxed linen thread, floral wire or even a rubber band, bunch and twist the stalks into a very tight bundle. Tie well and secure the arrangement. Using the sharp pruning shears, trim the bottom of the bundle until you have a length suitable for your table. The bunch shouldn't be taller than the tallest guest seated at your table. At eye level, while seated, is perfect. It's up to you how you want to finish the centerpiece, but if you happen to have some thick satin ribbon in an earth tone, use it. I love glossy, chocolate-brown ribbon for Fall decor. Tie a simple knot around the bundle and you are done! There is no need to do a bow. How easy was this? 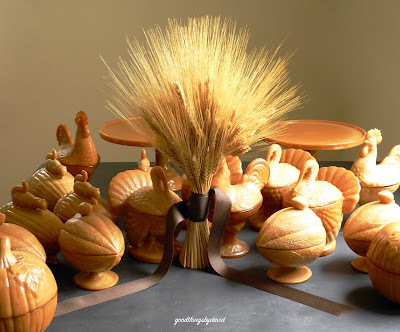 The nice thing about this kind of arrangement is that you can reuse it again next year for your table or you can place the arrangement on a coffee table, a mantle or even a console in the hallway throughout the year. 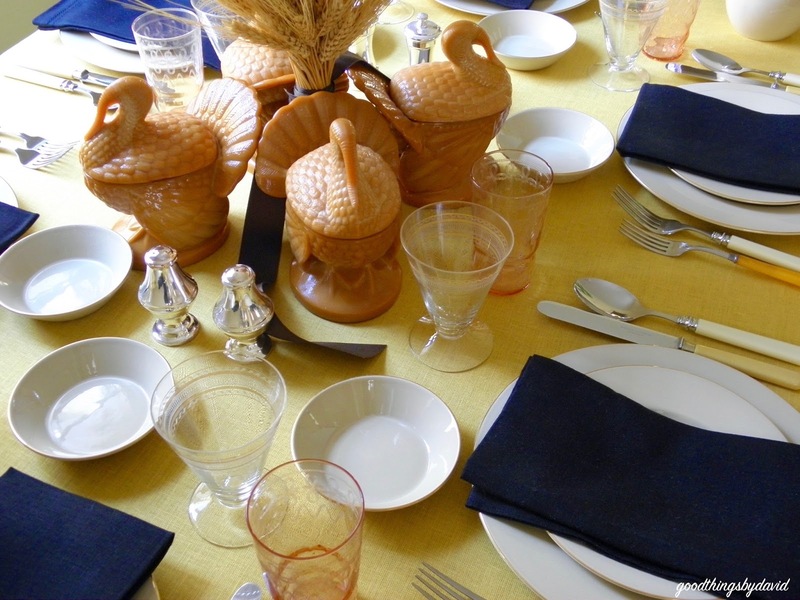 You can even surprise a host or hostess with one of these if you are attending a Thanksgiving dinner elsewhere. It is often said that we don't really choose our pets, they're the ones that choose us. I found out how true that really is a couple of weeks ago. My neighbor and dear friend Pam was taking a walk near a client's house the other week when she heard some crying coming out of a drainpipe. 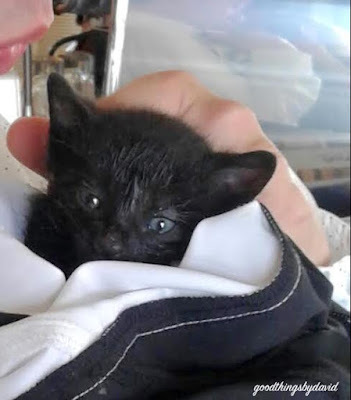 When she took a peek, she found a little abandoned kitten. Rather than going straight to the vets she brought it over to me at the cafe and asked if I wanted to provide the baby with a home. I was instantly smitten! Henry loves to be held. 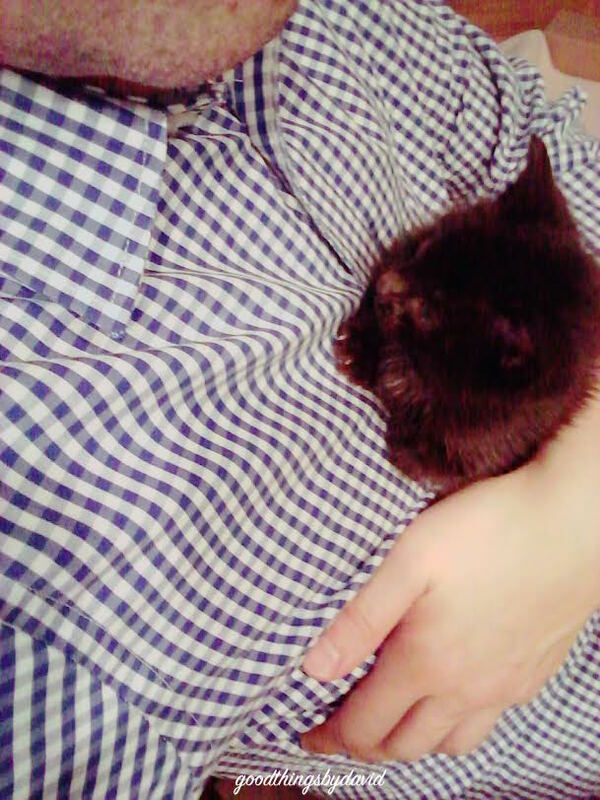 He's so tiny in my arms! This was the first time I held Henry in my arms. 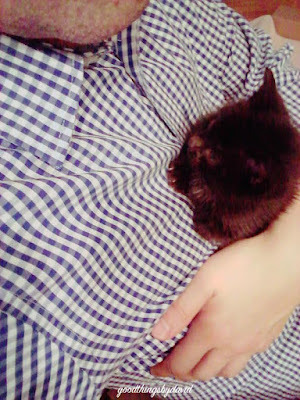 I remember Pam holding this tiny little bundle of black fur and feeling instantly like I had to protect the little one and give it a home. I won't forget how his meowing stopped the moment I held him in my arms. 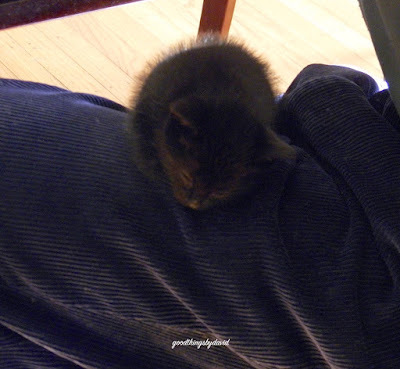 I think he knew that I could be trusted and that he would be safe with me. The decision was made right then and there. He could sit with us for hours if we let him. After spending a week at our fantastic veterinary hospital making sure he was healthy enough and eating properly, my baby came home to us several days ago. It's all about the power naps. 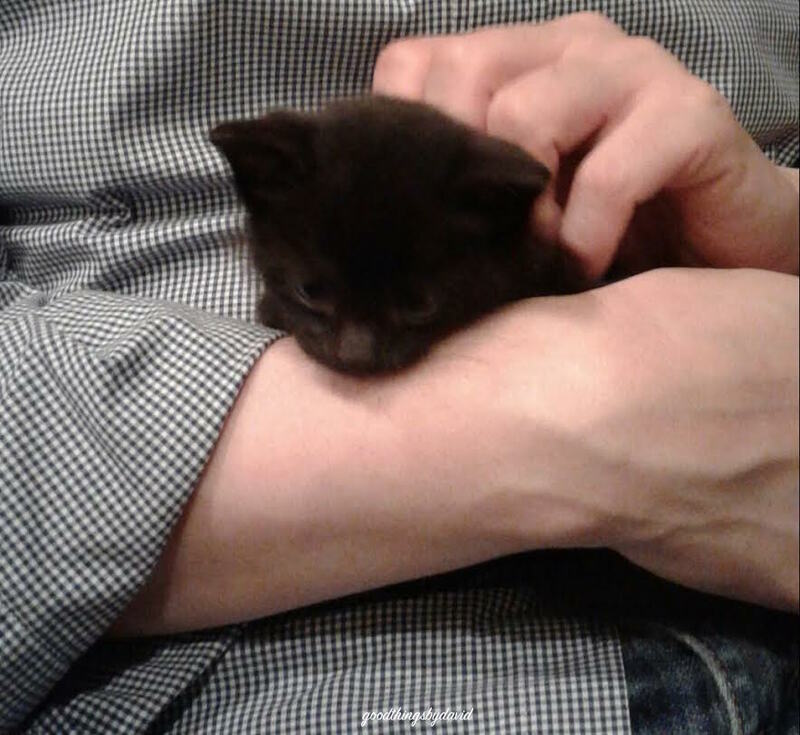 I wasn't exactly prepared to have another kitty after the passing of our beloved Lion, but how could I turn my back on this baby in need? He's so adorable! Henry is enjoying our tea breaks. 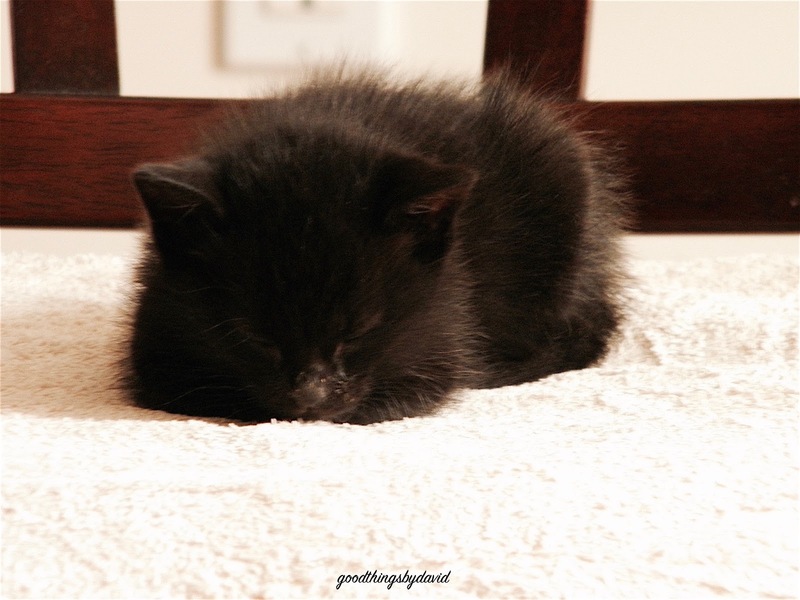 It's been a learning experience for us here at home with this tiny one pound baby cat. Henry loves to eat, he enjoys running around our home and he's already keen on sitting on our laps for tea break! Because he is only four weeks old and so small, we have to be very vigilant about where he is at all times so that he doesn't get under our feet. I think I've dropped everything that I thought was important this past week just so that I could bond with Henry and spend as much time with him. He is getting around the clock supervision (yes, he has a baby sitter during the day!) and is loving the attention. I'm not sure what Lion or Mistress would say about little Henry, but I am certain that we've made the right decision. Our friends have told us that this kitty just won the lottery because they know that we will provide him with a good home and a lot of love. Let's hear it for baby Henry! The trees this year have taken their sweet time turning, but I'll have whatever they give us because it's my favorite season. 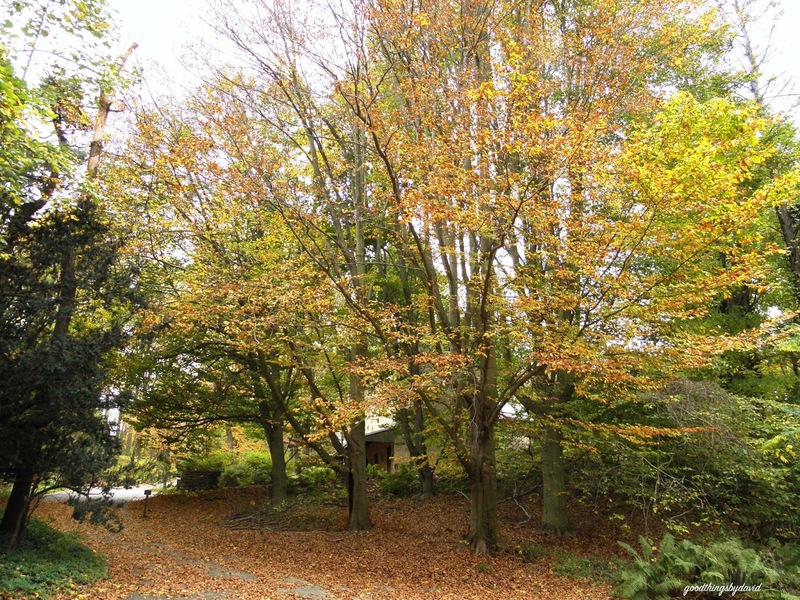 For some reason the Beech trees seem to be some of the most beautiful specimens around the property. 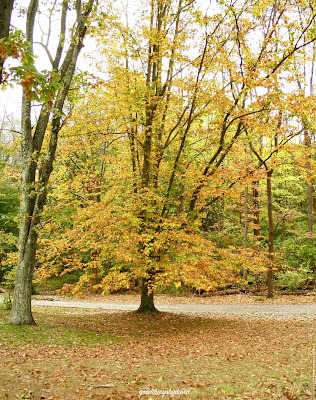 Tall, healthy and long-lived, each tree is absolutely perfect. 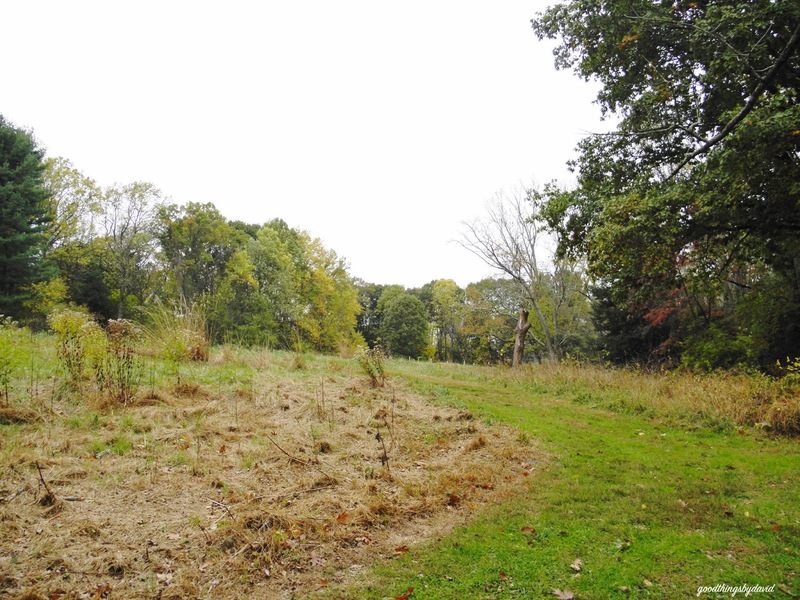 The landscape would be incomplete without them. I was having a long discussion with a loved one about old-growth trees and how vital they are to the ecosystem. 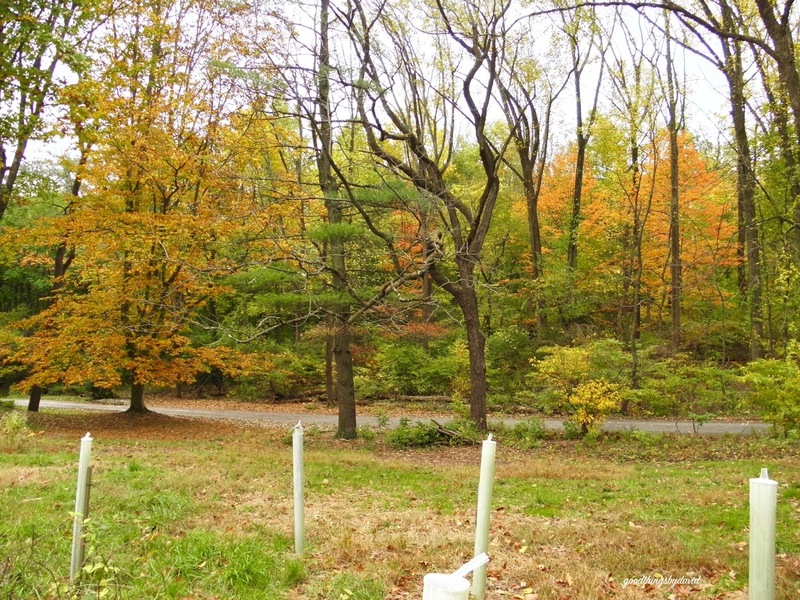 We recently noticed that a couple of neighbors have had the impudence to cut down such trees on their properties, much to our horror. There is nothing worse than seeing large healthy trees being cut down, and left sitting in great, big heaps waiting to be chipped. I can't think of any good reason, other than having a diseased or dead tree, to remove an old-growth tree just to tear down a home and perhaps erect a larger "stately" home. It's extremely unsightly. Alas, not everything thinks the way we do. 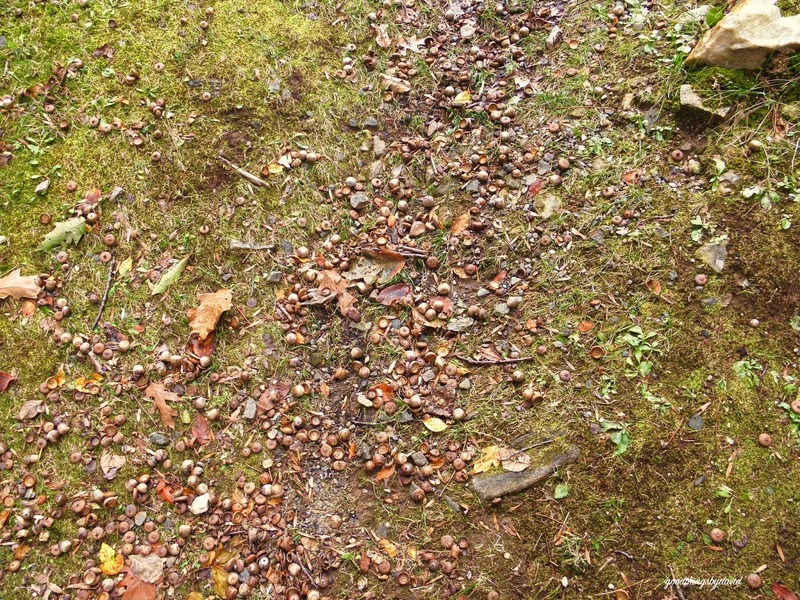 Making my way around the property, I've noticed that certain things have remained the same over the years, while others have changed dramatically. Diseased trees have been removed, many other specimens have been planted by the dozen throughout the field, and the healthier trees that have been here for decades are very prolific with nut production. 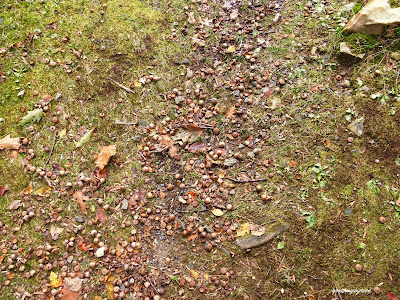 Acorns and black walnuts are everywhere. Our weather has been erratic here in the Northeast. Some days are cool, brisk and windy, which should be the case on any given November day, and yet, other days feel like early September. Warm and humid days don't seem right in November. How is it where you live? You can see some examples of the reforestation that is going on here. Saplings get extra protection from the elements and the wildlife with those sturdy wraparound tree guards, also known as tree shelters. Standing in this area and looking down onto the driveway is something I love to do when the foliage is changing. 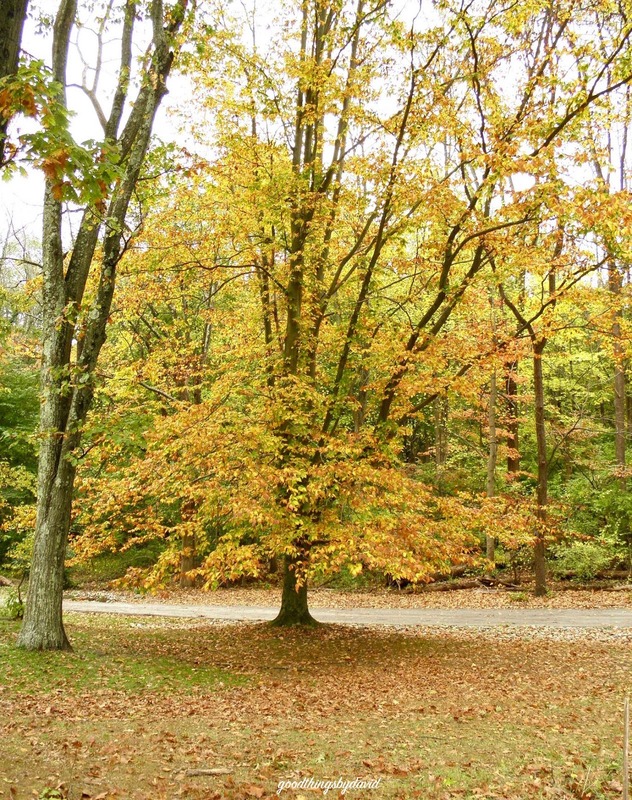 Each tree is different and every specimen takes its time. One thing I've always been taught is to respect mother nature. From the time that I was little, my parents, especially my father, instilled in us to always be mindful of not littering, disturbing the wildlife or spoiling our trees. I can still remember helping dad plant apple, apricot and peach trees in our backyard decades ago. It was my job to help water them when they needed it and to feed them accordingly. In fact, dad has always been a proponent of planting, caring for, and respecting trees, so that further generations can benefit from them. My hope and wish is that you get to plant a tree or two in the coming year, and help maintain any older trees that you may possess. Respecting mother nature is something I will always do.